Veterinary medicine is one of the most popular animal-related jobs, but there are many widely held misconceptions about this particular career path. Let’s take a look at seven of the biggest myths about veterinary careers. Veterinarians make decent money but it is not nearly what they could be making as human doctors. Starting salaries for vets are fairly low considering the huge amounts of student debt (often in the six-figure range) that they must pay off while trying to establish themselves in the profession. Specific earnings for vets can vary widely based on the type of medicine they practice, their years of experience, and whether they become board certified specialists. 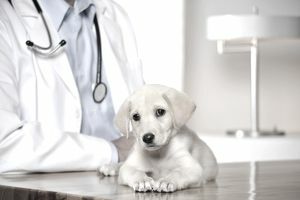 Getting accepted to veterinary school is difficult due to the popularity of the profession and the limited number of seats in each veterinary class. The applicant pool for veterinary medicine is of a very high quality, and it is arguably tougher to get accepted to vet school than medical school. Despite this high-quality applicant pool it is not impossible to gain entrance and you don’t need a perfect 4.0 GPA. In recent years many students have chosen to attend international programs (such as those in the Caribbean) that have slightly lesser admissions requirements. Others work for a year to gain experience and then reapply. You most certainly do not have to major in pre-vet, animal science, or biology major to gain entrance to a vet school program. These are helpful majors that often include most or all prerequisites for applying to vet school, but you can major in any area that interests you provided that you also take the courses required for admission. Veterinarians graduate from a four-year medical school program and earn a Doctorate in Veterinary Medicine (DVM). They are doctors in every sense of the word. A vet must achieve proficiency in treating many species, making their medical skill set quite impressive. Veterinary medicine once was a male-dominated profession, but it has reversed course in recent years. The American Veterinary Medical Association (AVMA) found that in 2014 there were 102,584 practicing veterinarians with a significant gender gap: 58,148 females and 44,258 males. Food animal medicine is still overwhelmingly male-dominated (81 percent to be exact), but most other areas show an even split or a greater number of women practitioners. Vet school enrollment tells a similar story, according to data collected by the American Association of Veterinary Medical Colleges (AAVMC). In 2014, women held 76.6 percent of vet school seats, while men held 20.4 percent of vet school seats. Most industry experts agree that there is no shortage of veterinarians on a large scale, but there may be shortages in specific niche areas of practice (such as large animal medicine) and in some rural areas. The number of graduates has increased sharply in recent years as more vet schools (domestic and international) have opened, and as some established vet schools have increased the number of students per class. While all vet students must learn about small animal medicine and many go on to work in pet-related practices after graduation, the profession is not at all limited to this sort of work. There are many other areas to consider including large animal medicine, exotic animal medicine, mixed practice medicine, equine medicine, and a variety of board certification specialty areas. There are many other options for veterinarians including teaching, research, government regulatory work, military service, consulting, and corporate employment.